Separation allowance for dependants of seamen, marines and reservists borne on the books of HM Ships. 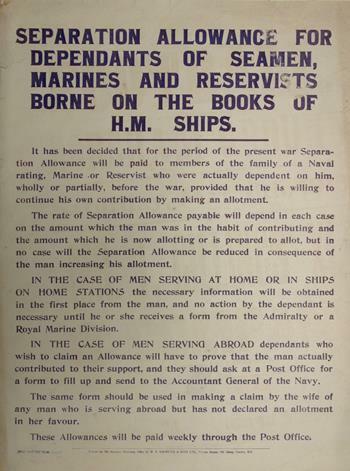 It has been decided that for the period of the present war Separation Allowance will be paid to members of the family of a Naval rating, Marine or Reservist who were actually dependent upon him, wholly or partially, before the war, provided that he is willing to continue his own contribution by making an allotment. The rate of Separation Allowance payable will depend in each case on the amount which the man was in the habit of contributing and the amount which he is now allotting or is prepared to allot, but in no case will the Separation Allowance be reduced in consequence of the man increasing his allotment. (then follows details as to what action is necessary to claim). These allowances will me paid weekly through the Post Office.